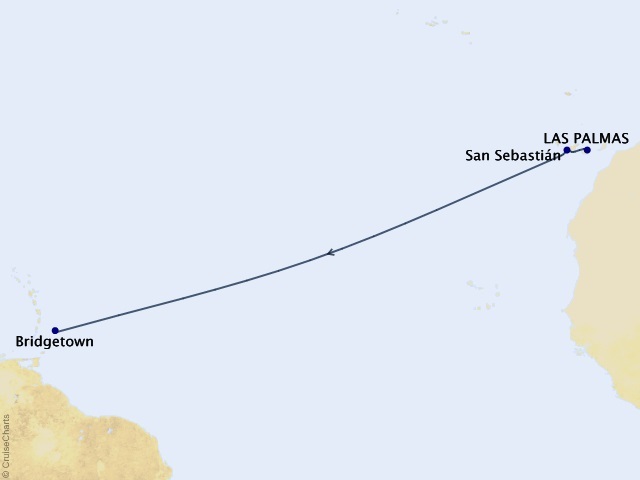 Departing from Las Palmas (Gran Canaria) on November 8, 2019, prices starting at $2,200. Created for luxury-loving passengers who also love the traditions and romance of the legendary era of sailing ships, just 170 guests travel in pampered comfort aboard the Star Flyer. Like her sister ship Star Clipper, the two vessels celebrate Star Clippers’ proud nautical heritage and are as fleet as the wind and as graceful as swans as you see the world like never before. A true clipper ship with all the modern amenities you can want, Star Flyer feels like you're traveling on a private yacht rather than a cruise ship. In fact, you’ll find that these ships offer more outdoor space per passenger than most conventional cruise ships. The décor of Star Flyer and Star Clipper is reminiscent of the grand age of sail with antique prints and paintings of famous sailing ships, teak and gleaming mahogany rails, a convivial indoor-outdoor Tropical Bar and Piano Bar, and an Edwardian style library where a Belle Époque fireplace glows with a warmth that reflects the friendliness and enthusiasm of Star Clippers’ hospitable officers and crew. Friends gather round the Piano Bar and join in singing a few favorites. 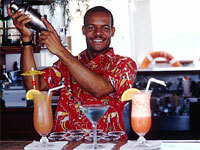 In the Tropical Bar, the bartender shakes a pitcher full of some delicious cooling concoction. Is there anything more relaxing than this? Clearly this is not a cruise ship in the ordinary sense. You will find that there are no rigid schedules aboard the Star Flyer. You are free to do as you wish with your days. Local performers are invited onboard to give passengers an authentic taste of the local music and arts. Help yourself to a continental breakfast with flaky croissants, toasted English muffins or sweet Danish pastries. 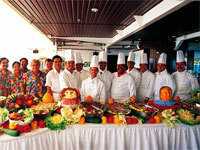 Or savor a full breakfast of fresh, tropical fruits and crisp bacon, smoked salmon, and omelettes cooked to order. When evening comes, the elegantly appointed dining room becomes the setting for the chef's finest culinary presentations, designed to please both the eye and the palate. All complemented by equally fine wines, and friendly and gracious service. Luxurious Large Outside Stateroom. Double Bed, Sitting Area, Minibar, Private Marble bath with Whirlpool Bath. Inside Stateroom, Upper/Lower Berths, Private Bathroom.